Well, hello Miami! I know, I know - I am posting this from Sydney in the middle of winter, but I may as well be amid the Miami heat as this label's latest offerings - straight from the catwalk at 'Miami Swim Week' 2012/13, held just this week - are scorchers. It follows the label's successful show at this year's MBFWA 2012 [Australian Fashion Week]. Here are some of my fave looks from the parade. All those bronzed bodies, and delicious pops of colour, complete with just-right beach-hair and perfectly matched accessories. Heaven. 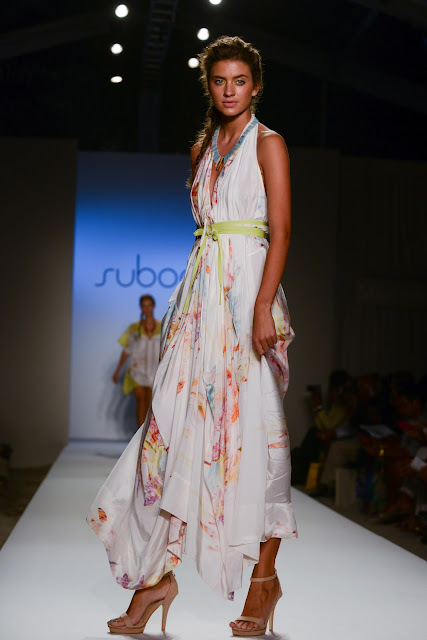 According to Suboo designer Sue Di Chio, “This is our second year in Miami and our first showing at Fashion Week, we are excited to unveil our ready-to-wear and new collection to the US. Miami Fashion Week is a natural stage for a collection this exciting where bold, summery colours and flowing shapes are key features”. The Australian fashion label was launched in 2007, as a lifestyle accessories brand and soon reached a kinda cult status, with fans all around the world. Worn by Australian personalities and fashion aficionados including Dannii Minogue, Miranda Kerr, Delta Goodrem, Jesinta Campbell, Nikki Phillips, Zoe Balbi, and Casey Burgess, Suboo is not only launching the ready-to-wear and swimwear collection for the first time to the already enthusiastic US market, it's now distributed in over 200 international and Australian boutiques including David Jones department stores, Japan, Singapore (Barneys and Kitson), USA and UK, with further global expansion plans on the horizon.